Kiste - means box in German. German word is not an accident, because the project "Kiste-net, international cultural space" was born during my conversation with Austrian artist Max Goeshle (Group Union B), one drank night in one smoked out pub on Gorohovaya str. in the St-Petersburg, in Novenber of 1996. That time was created new way for artistic and public relationship, alternative for internet .Virtual space - was again recreated into material form. 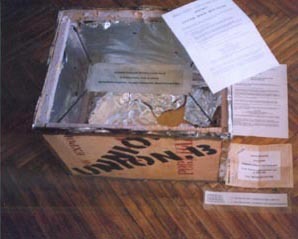 Travaling box - real travalling space, in the same time kind of gallery, museum, archive, and privet message opened for anyone, started to collect atictic messages for bringing them from one artist to other one, to all others, because nobody really know when and if the box/boxses will ever finish his/their worl world wide trip. Project started in February of 1997 from Wien to St-Petersburg, than to Solothurn. Now, on the present moment, September of 2001, box is in Sidney.